I recently finished Clayton M. Christensen’s How Will You Measure Your Life?. My friend and former client recommended the book to me. Christensen’s a professor at Harvard, and he starts out the book addressing his class. Indeed, the book has a certain business flavor to it. Yet, it’s relevant to think about what success looks like beyond our careers and what we do for a living. I need to met my hygiene and motivation factors to be happy. Frederick Herzberg developed the Two-Factor Theory. The Theory helps explain what drives us and what causes us to both hate/ love our jobs. This is something I’ve heard countless times from business school and a book I’m reading now. Hygiene factors include pay, status, company policies, etc. In business school, I learned these are “extrinsic motivators”. Motivation factors included the actual work (fulfilling? Challenging? ), recognition, personal growth, etc. These were also known to me as intrinsic motivators – these are internal sources of drive. Satisfying both factors is critical for me, and why I do what I do. Be open to emergent opportunities, not just jam everything into a deliberate path. Deliberate paths are just that – planned, executed strategies. Emergent is a path where other opportunities provide a new direction (“emerge”). In startups, this is a pivot. It’s important to be open and even sometimes look out for emergent opportunities. Everything has some purpose, some job to do. This is better known as Christensen’s Jobs To Be Done Framework. The framework is about recognizing that everything we use has some job. Even the people around us perform jobs for us. That could be a friend to hang out with to be happy; a spouse to lean on when times are rough; or, a colleague to help execute a project. Even a milkshake has a job to do. Milkshakes can be a simple breakfast alternative for busy adults. They can also be a treat to occupy children. So, think about what others provide to you as the job to be done. Also, recognize what job you fulfill for your friends. How you live is all about your resources, processes, and priorities. Christensen points out how we strive for more resources without considering the processes to which we use them. For example, it’s common to give children more learning tools and more classes. However, it’s just as easy to pass on teaching and childcare to a daycare or nanny. Parents, then, are outsourcing the parental process. Parents are outsourcing how their children learn and how they process – think, act, execute. Priorities set the culture to how we devote our resources and enact our processes. Priorities are where we determine for what and who we make our time for (the one resource we never get back). It all comes back to culture. One of the book’s final chapters is, “The Invisible Hand Inside Your Family”. “Invisible Hand” here referring to culture. We (I) talk about culture in business, but it permeates all facets of our life. Christensen happens to address culture in the family. Specifically, culture is about the values and mission taught to children. Culture is rarely formalized. Instead, it’s recognized through the norms we practice. It’s absorbed by our children and those around us. “Just this once” is once too many. It’s the slippery slope that makes this one action okay. It’s the rationalization that a single time is okay as long as it’s not a habit. That one time makes it okay once. So why wouldn’t life repeat itself where it becomes okay twice? Three times? The moment our integrity slips, the easier we can let go of our integrity more often. That moment we make that excuse that today, I’m too tired to work out so I won’t go to the gym. The next time I’m tired, I can rationalize again. One time. It can speak volumes. One time can lead to a path. 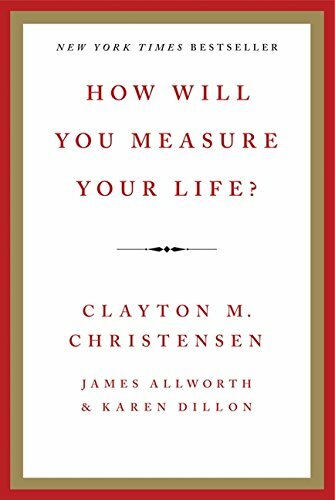 Christensen’s book was great for me to remind myself of what’s important and what really drives me. I’ve written several times about what motivates me and the pull I sometimes feel as I consider my current and future direction. Great book to read, and think about our lives professionally, personally, socially, and beyond.